2018 Halloween Escapade is here! Enjoy new scenery, items, and fight the terrifying boss, Spook! Lauren’s Family Gift event also returns. Stock up on those gift boxes for glamorous rewards. All those and more in the patch notes so read on and find out for yourself! ◈ Happy Halloween! As Halloween is near, the Halloween-themed background will fill up the world of Black Desert Online. ◈ Halloween Escapade 2018! Enter if you dare. will be able to face Spook so have courage and step up to the challenge! • Isabella the Black Witch from last Halloween is making a welcome return and this time, you'll know when to face her! • Many more Halloween-themed Quests and Challenges via Challenge tab (Y) are available so don’t forget to enjoy the spooky times to the fullest. -Click < Here > for full details. • Lauren Family Gift Boxes are back! Don’t miss your chance to claim prestigious rewards once a day from the exquisite gift box! -Click < Here > to see how you can collect [Event] Lauren Family Coin to exchange for [Event] Lauren Family Gift Box! 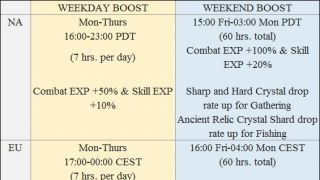 • Please keep in mind any new accounts created before maintenance today (10/17) still have 7 days to complete the event. For example accounts created at 06:59 UTC, 10/17 will have until 06:59 UTC, 10/24 to complete the event and receive their reward. • Top 1 NA & EU winners have been decided. Rewards will be sent shortly. 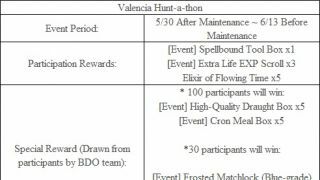 • Top 20 NA/EU winners for the event has been decided and in-game rewards have been sent via in-game mailbox (B). -Please check official forum post for the announcement of the winners. 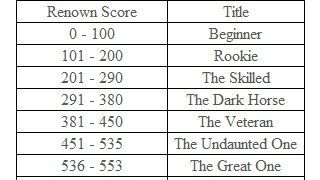 • Top 10 (from NA & EU combined) winners have been decided. Rewards will be sent shortly. • Trailers with Top 50 Views have been decided and rewards have been sent via in-game mailbox (B). • Exclusive Titles have been sent to winners. 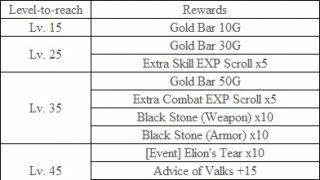 • Rewards for winners have been announced here and in-game rewards have been sent via in-game mailbox (B). 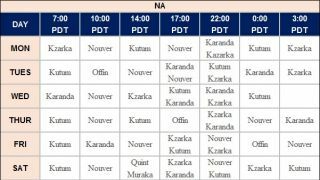 ◈ Gathering is now possible for most of the Hunting Monsters except for those listed below. • Looting methods depend on Contribution of self or to the Party. • You cannot Interact (R) without Gathering rights. • This rule applies only to Hunting Monsters that can be Gathered from after death. 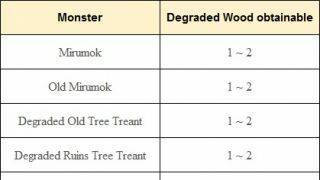 • The following Hunting Monsters will follow the previous rules. 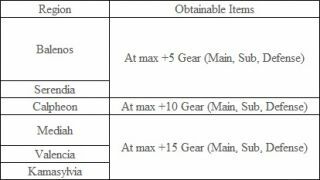 ◈ Probability in catching Fish in fishing points at Velia has been changed. • The probability to catch Grunt, Moray, and Sea Eel (of Big Fish) has increased. ◈ It has been changed that information of Conquest Status can now be checked even on servers where Conquest War is not occurring. ◈ Halloween-themed music will be playing at night in Velia, Heidel, Calpheon, Altinova, Valencia, and Grána. ◈ Graphical generation of NPCs in heavily-populated areas has been improved. 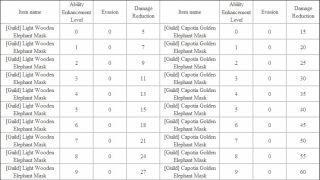 • The improvement is focused on passing fast through heavily-populated areas filled with other adventurers and NPCs. 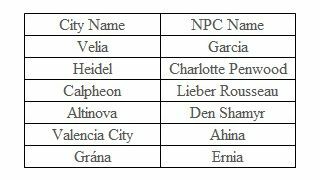 ◈ Fixed the issue where crashing would occur along the roads of Heidel, Calpheon, Epheria, and Tarif. ◈ Fixed the issue where flowers and grass placed in the garden in Calpheon would not be displayed intermittently. ◈ Fixed the issue where the appearance and race did not match in some of NPCs of Altinova. ◈ Fixed the awkward camera vision when interacting with certain Villager NPCs in Altinova. ◈ The skill icon and skill description that appears on the UI of the Skill Guide upon using Horse skills have been improved. ◈ Fixed the issue where Karma would not be decreased when hitting another Adventurer for the first time in PvP mode. ◈ Fixed the awkward motion when going up obstacles in non-Awakening combat mode. 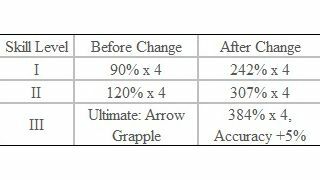 ◈ Fixed the issue where skill lock was not being implemented for Rage Absorption (Innate). ◈ Fixed the typo in the Rage Absorption effect icon. 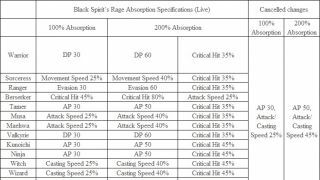 ◈ It has been changed that upon using Rage Absorption when Black Spirit’s Rage is below 100%, the motion of Rage Absorption will not come out. ◈ Fixed the issue where the character would stop (freeze in motion) intermittently. ◈ Fixed the graphical glitch in the top of the head when having the Snowflake Hat equipped for female classes. 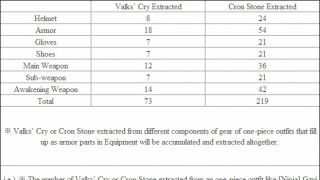 ◈ The text description regarding Rage Absorption effects has been revised to sound clearer upon using Rage Absorption. ◈ Performing the combo into Blasting Gust after using Ultimate: Evasive Shot to the right side has now been made more natural. ◈ skill tooltip of the skill Spirit Healing has been fixed to be more accurate. ◈ Fixed the awkwardness in the landing motion after jumping forward in main weapon combat mode. 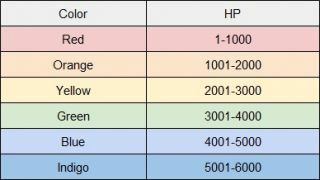 ◈ The Heilang’s HP has been increased by 10000% compared to before (or x100) in all levels. 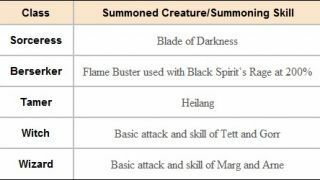 • The Heilang’s HP compared to other Summoned creatures was set considerably lower initially which made it hard to utilize Heilang in some of the Danger Zones. 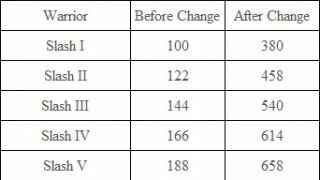 We have implemented this change to bring up Heilang’s HP to a stat. Similar to the other Summoned creatures. ◈ Fixed the graphical glitch in the neck part when customizing the Valkyrie. ◈ Fixed the graphical glitch where the ornament in the front of the Order of the Apricot Helmet would appear to be penetrating through the hair at a certain angle. ◈ Fixed the awkward graphics in the inner thigh part of the Ninja when having the Warhawk outfit equipped. ◈ Fixed the graphical issue where the skirt part of the Eunyoo outfit would appear to be cut off when having a certain Shoes equipped. ◈ An exclusive motion for wearing Bloody Outfit has been added. ◈ Fixed the awkwardness in the character’s expression when performing a leaning motion. 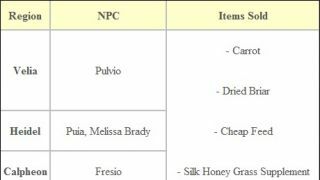 ◈ Firecracker item has been changed so that it can now be sold in NPC shops. 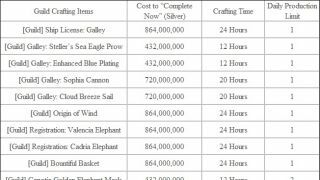 ◈ Old Moon Anticorrosive item has been changed so that it can now be sold in NPC shops. ◈ Archaeologist's Map and Lafi Bedmountain's Upgraded Compass items have been now changed to be Family-bound. ◈ Any Archaeologist's Map and Lafi Bedmountain's Upgraded Compass items stored with your Mount has been moved to Storage in Heidel. ◈ It has been fixed that Item Exchange button for Mutant Enhancer will not be displayed anymore when interacting with Gorgath without having Mutant Enhancer in possession. ◈ the issue where the certain Fish appeared in Crafting Notes when it shouldn’t. ◈ Happy Halloween! Brand new Halloween outfits for 2018 has been For details on newly added Pearl Shop Update, please click < Here > ! 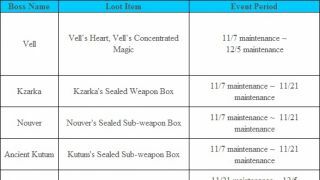 ◈ Special looting period for Vell has ended. • After the event is over, you would need to inflict over 5 to 6 hits in order loot rewards individually/in a Party/in a Platoon. ◈ The maximum distance that the Gray Wolf would chase you after has been decreased by 50%. 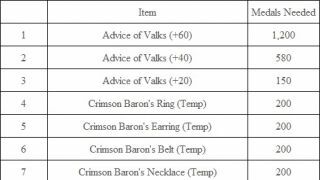 ◈ The damage of continuous smashing attack of the Dastard Bheg in the quest ‘[Boss] Frenzied Altar Imp Captain’ has been decreased by 60%. ◈ Fixed the issue where ‘Show a Seagull Feather’ button would be activated when interacting with NPC Crio while having Seagull Feather in possession. 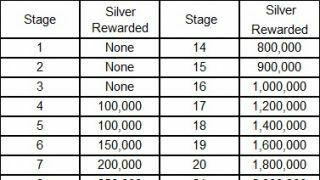 ◈ The probability to catch the completion target Fish in the following quests has increased. ◈ Fixed the issue where the preceding skill on the skill description of a Mount would not be displayed. ◈ Fixed the issue where placing an instalment using certain skills would not activate Placement Mode. ◈ Fixed the issue where unnecessary Processes (under Task Manager of your PC) would be activated when entering Guild window. ◈ Fixed the issue where Mount information would not be updated when Repairing Ship harboured in Wharf. ◈ Fixed the issue where the desert background appeared awkward in Remastered Mode or Ultra Mode. ◈ Fixed the issue where the skin tone and shades of the character or horse appeared unnaturally in a certain distance. 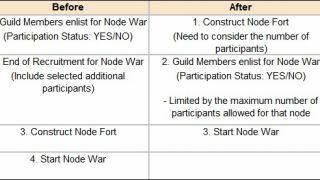 ◈ It has been changed that Reward button in Guild Member Status window under Guild (G) menu will not be activated if there is no participation reward for Node War. ◈ Fixed the issue where the tooltip showed a discrepancy of the grade in certain Fish Species. ◈ The following text has been added to the system message that appears when applying to participate in Node War. ◈ Fixed the issue where the Marketplace window that opens up from using Transaction Maid/Butler would be closed regardless of “Hide the UI window when attacked” settings. ◈ Fixed the issue where the Challenge ‘[Combat Reward] Faster and Stronger’ would be greyed out for characters who had not completed the Challenge before. ◈ Fixed the issue where the probability to catch Big Fish (a tier of Fish) was lower in certain fishing points. ◈ We are aware of the issue where event items [Event] Halloween Candy Basket and [Event] Halloween Cookie obtained from the previous Halloween event are not being combined to create the [Event] Halloween Gift Box. This will be resolved next maintenance. 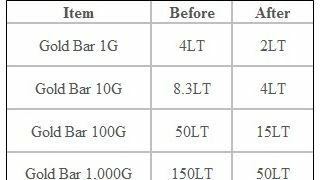 ◈ We are aware of the issue where crops are not being planted properly in Place Mode (R) in Garden. ◈ We are aware of the issue where changes made on Camera Afterimage Effect Settings will not be implemented.